If you live in a tropical place – or would just love to spend the holidays on a beach – this might be just the stamp set for you! 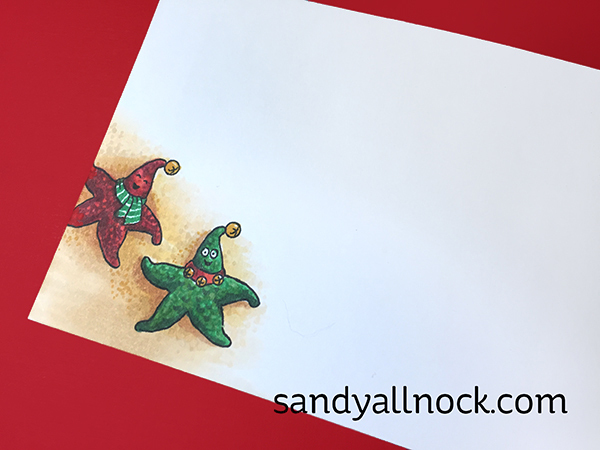 I show you in the video how to color the images, and then add just a little beachy background. Hope you enjoy – watch the video below or click HERE to see it in HD on YouTube. Love your Aanta and tropical scene. I live in the desert so the palm tree is appropriate.. You are so talented and have taught me so much!! A beautiful job on this Sandy and the envelope is awesome! I love the coloring!And I love the fact that you make it seem simple enough to be tempting to try it! Thank you for sharing! Wow!. You turned a few little stamps into an amazing scene. Such a wonderful presentation! Oh! Sandy! I love you girl! Everytime I watch you I learn something new. Thanks! The little education on the sand details and NOT making a polka dot card was awesome. I will remember that one. And as always, love your card design, oh, and the envelope. 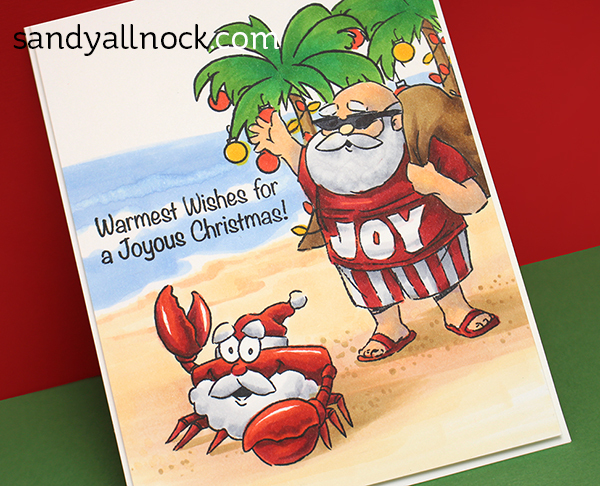 I’m not sure which I like more–the crab santa or the starfish rocking the envelope! Living at the beach this is one cute card. That crab would make one tasty crab cake though. Greetings Sandy from Australia, your card definitely made me think of our Aussie Christmas. I just love it. After our day of 39 degrees Celsius (about 102 degrees Fahrenheit) yesterday this card is very timely and certainly made me laugh out loud. Have a fabulous day. Cheers Donna Z 🙂 PS it’s raining here today with an expected temp of 16 degrees celsius (about 60 degrees Fahrenheit) although at the moment( 6:30 am) it’s very muggy so I suspect it will be warmer. I laughed out loud at this fun image! I made a card for the “other grandmother” while having a Christmas craft day with my grand-girl. She loves the beach, so we made a card with actual sand! Then, I had to make a “sand” man to put on the beach. We used some blue green confetti for the water. It’s not exactly what I intended, but in the end, we did it together– and you can’t buy that with mastercard because it’s priceless! Thanks. I applaud your safety pin. Thanks for continuing. Super card!! Love how you finished your scene. I couldn’t resist…had to order. A tropical beach would be great today. Brrrrr. Great card. This set will be on my wish list for next year since I got lots of new Christmas stamps this year. Another great video. I like your voice-overs and how you actually show the number of the marker you are using. As always, you are so at ease when coloring. Those little details in the water, sand, and your shadows add so much. Thanks for all you do and share. I saw this at 6 am while eating breakfast. I absolutely love the way you shade and highlight. I’ve been a wantabe Copic artist for a long time and just recently discovered you! I know your teaching has already improved my attempts at coloring using Copics and water color, which I had never done before you. Santa and his crab really started my day off right! Thank you! Such a beautiful beach scene. Love your coloring!! Thank you for sharing the video. Sandy, I’d love to learn from you…the basics of what you do intrigues me. I would highly recommend Sandy’s CopicJumpstart class. I love the class & the way it’s set up I can go back to the lessons anytime. 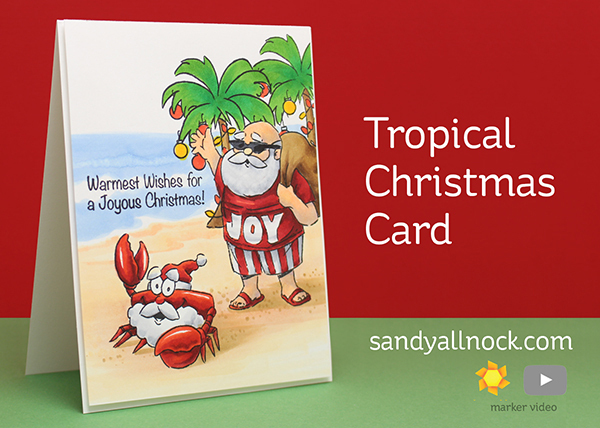 I’m landlocked in the midwest – but this card is just too much fun! Love the way you bring everything to life. Is it the change in seasons? In the last week or two, I’ve had bloopings from Copic markers I’ve had for months… weird. But you recovered from yours with style!